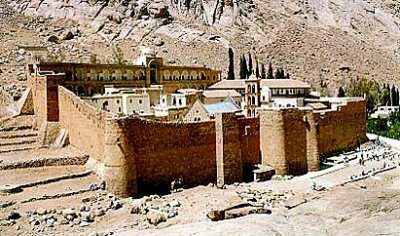 Located at the foot of Mount Moses, St. Catherine's Monastery, was constructed by order of the Emperor Justinian between 527 and 565. St. Catherine's is also a formidable fortification, with granite walls 40 to 200 feet tall, surrounded by gardens and cypresses. Find more Sinai images in the gallery of Photorena.